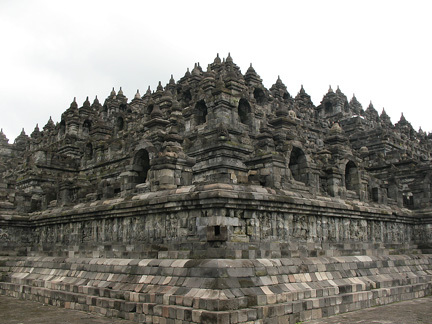 Borobudur is one of the most famous Buddhist monuments in the world and is the most visited tourist site in Indonesia. It is a Mahayana Buddhist stupa monument that is located in Muntilan, Magelang in Central Java, Indonesia. It is about 42 km from Yogyakarta city. It is believed to be the largest Buddhist monument in the world. This colossal temple was built between AD 750 and 842 that is 300 years before Cambodia's Angkor Wat, 400 years before the great European cathedrals. The name is believed to have been derived from the Sanskrit words vihara Buddha uhr, meaning the Buddhist monastery on the hill. The timeline for its construction time has been estimated by comparison between carved reliefs on the temple's hidden foot and the inscriptions. This monument was likely founded around 800 AD, the peak of the Sailendra dynasty in central Java, when it was under the influence of the Srivijayan Empire. The construction has been estimated to have taken 75 years. At this time, the Saliendra dynasty built a great number of monuments, both Hindu and Buddhist, in the region there are even temples where the two religions combine, alternating symbolism. This ancient temple lay hidden for centuries under layers of volcanic ash and thick jungle growth. Sir Thomas Stamford Raffles is credited with the re-discovery of this temple in 1814. During his visit in Semarang, he received a report indicating the discovery of a hill full of several carved stones, a site believed by the local inhabitants to be of an ancient monument called budur. Sir Raffles then commissioned a team to investigate the hill. This ancient temple has since been preserved through several restorations. Borobudur is built as a single large stupa, and when viewed from above takes the form of a giant buddhist mandala. A mandala is central to Buddhist and Hindu art. Mandala is the basic form of most Hindu and Buddhist mandalas is a square with four entry points, and a circular center point. The architecture of this temple simultaneously represents the Buddhist cosmology, symbolically depicting the path of the bodhisattva from samsara to nirvana. Representing the existence of the universe, Borobudur perfectly reflects the Buddhist cosmology, which divides the universe into three intermingled separate levels. The three levels are Kamadhatu (world of desire), Ruphadatu (world of forms), and Arupadhatu (world of formlessness). The monument comprises six square platforms topped by three circular platforms, and is decorated with approximately 2,672 relief panels and 504 Buddha statues. These Buddhas are in meditative pose, and the 6 different hand positions represented throughout the temple, often according to the direction the Buddha faces. The total relief surface is about 2,500 square metres (27,000 sq. feet) and they are distributed at the hidden foot (Kamadhatu) and the five square platforms (Rupadhatu). This temple complex was built on several levels around a hill which forms a natural centre. Kamadhatu is represented by the base, Rupadhatu by the five square platforms (the body), and Arupadhatu by the three circular platforms and the large topmost stupa. The first level above the base comprises five square terraces, graduated in size and forming the base of a pyramid. Above this level are three concentric circular platforms crowned by the main stupa. Stairways provide access to this monumental stupa. The base and the balustrades enclosing the square terraces are decorated in reliefs sculpted in the stone. They illustrate the different phases of the soul's progression towards redemption and episodes from the life of Buddha. The circular terraces are decorated with no fewer than 72 openwork stupas each containing a statue of Buddha.